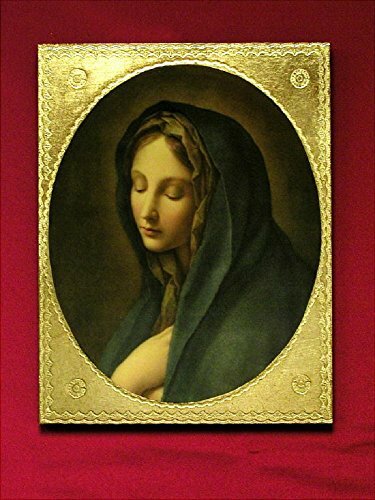 Our Lady of the Sorrows by Carlos Dolci Florentine plaque, 9 x 12 inches. Made in Italy. Last Supper Tapestry with an ornate gold-painted wood frame, 35 x 16.5inches. Made in Italy. A standing Crucifix in shiny brass, 14.5inches . Made in Italy. A beautiful Standing Crucifix in antique brass with a heavy three point base, 13inches. Made in Italy. RELIGIOUS STATUE - FIGURE, A Standing Crucifix in a shiny, silver-plated brass, 11.5inches. Made in Italy. RELIGIOUS STATUE - FIGURE, Our Lady of the Smiles by Ennio Furiesi in white alabaster on a quality wood base, 16. Made in Italy. Crucifix with hand-painted alabaster corpus on a wood cross with gold highlights, 20inches. Made in Italy. Ceramic Crucifix in hand-painted ceramic with flowers, 24inches. Made in Italy.